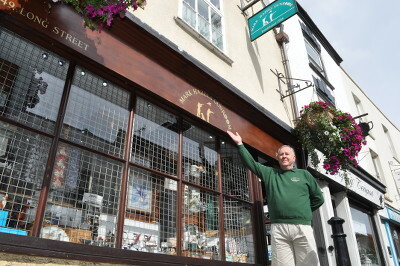 A Gloucestershire based shooting and country enthusiast's shop is celebrating 25 years of continuous trading despite the difficult business environment of the last few years. A Gloucestershire based shooting and country enthusiast’s shop is celebrating 25 years of continuous trading despite the difficult business environment of the last few years. Established in 1988, Mark Hazel’s Gunroom has carved out a niche market in Wotton-under-Edge for those who enjoy country pursuits. Very much a one-man-band he started the business when as an engineer his work moved him to Yate. Not long afterwards the factory in which he was worked was closed and he decided that he didn’t want to leave the area. He had always been interested in the countryside and in particular all types of shooting since he was a lad. While pursuing his hobby he had felt that there were some deficiencies in the service he was getting from existing shops in the area so he decided to put that right by starting a business himself. Mark commented on recent changes in legislation and the effects of the two recessions he has experienced. He said: “No law will prevent a criminal mind from carrying out an unlawful action and all the changes in the gun laws have done is to put more pressures and unnecessary restrictions on the law abiding members of our community.